Few owners would survive the kind of scrutiny that Donald Sterling has been subject to, and that’s exactly why it should be applied. Let’s start with the obvious. Behind every great fortune is a great crime and, with the exception of the 364,122 owners of the Green Bay Packers, there’s no owner in pro sports who does not have some blood under their buffed fingernails. This is a club of billionaires, and that kind of money doesn’t come from scratching Lotto tickets. But even though many owners are far from cuddly creatures and have taken part in “wealth building” exercises that make Sterling’s archipelago of slums look like a side project, we should not be cynical about what just took place in the NBA. In fact, we should embrace it. That pointed reference to Sterling’s years as a slumlord immediately raises the issue of what Dallas Mavericks owner Mark Cuban fearfully called the “slippery slope.” As Cuban said, “If it’s about racism and we’re ready to kick people out of the league, OK? Then what about homophobia?… What about somebody who’s anti-Semitic? What about a xenophobe? In this country, people are allowed to be morons.” I can’t speak for Cuban, but given the billions in public dollars handed to owners in public financing, tax breaks and public trust, I don’t think it’s too much to ask that the owner of a franchise not be a raving bigot. But Cuban also of course pointedly ignores that Sterling was a bigot in word and deed. Mark Cuban is not, to use his language, “a moron.” The real fear that beats in his libertarian heart is that the harm caused by Donald Sterling’s business practices could be used against other owners as well. After all, if we start judging in the public square how billionaires make their money, few would dare to even leave their house. If Donald Sterling’s slums make him unsuitable to own an NBA team, what do we say about the repeated chemical dumping practices of Jacksonville Jaguars owner Shahid Khan? His company Flex-N-Gate has been cited for “39 violations of hazardous waste regulations over 20 years.” Workplace conditions at Khan’s plants have routinely sent his employees to the hospital. Chemical dumping also has a long history of racism, as the neighborhoods with the least power get the dumping and the ensuing ill-health effects. If Donald Sterling is a public embarrassment, what do you say about David Glass, owner of the Kansas City Royals and former CEO of Wal-Mart. In 1992, Dateline NBC broadcast damning scenes of Bangladeshi children slaving away at Wal-Mart products. When asked to defend this practice, Glass said simply, “You and I might, perhaps, define children differently.” He stomped out of the interview before answering why signs in Wal-Mart that said “Made in America” were hanging over goods made by Bangladeshi children. Yet David Glass remains. And then there is Dan Snyder, owner of the Washington football team. I’ve written about Snyder enough. Either we accept racism in sports or we oppose it. In the post-Sterling world, we have had politicians from Harry Reid to John McCain who have said that it is time for the name to change. Not only does Snyder clutch onto the team, but also does so like a cornered bobcat, lashing out at anyone who dares encroach on his precious brand. If Sterling’s racism has no place in sports, then the question of how the Washington football team can continue to be named after a slur becomes a crackling, livewire discussion. Maybe Mark Cuban is correct. Maybe it is a slippery slope. 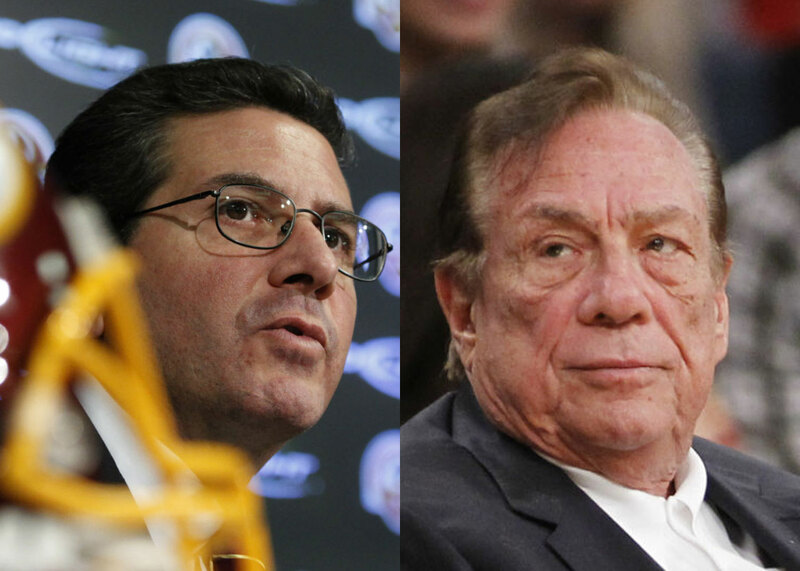 And maybe, after so many years of billionaires living above any semblance of the law, this Donald Sterling moment is even bigger than we think. Maybe, this slope should be greased up and we should not be afraid to get behind the once untouchable owners in professional sports and give a little push.